What conditions does Sprycel treat? Tell your doctor right away if you have any serious side effects, including: dry cough, swelling hands/ankles/feet, sudden/unexplained weight gain, shortness of breath. Get medical help right away if you have any very serious side effects, including: vomit that looks like coffee grounds, black/bloody stools, severe dizziness, fainting, fast/slow/irregular heartbeat, chest pain, confusion, weakness on one side of the body. Dasatinib sometimes causes side effects due to the rapid destruction of cancer cells (tumor lysis syndrome). To lower your risk, your doctor may add a medication and tell you to drink plenty of fluids. Tell your doctor right away if you have symptoms such as: low back/side pain (flank pain), signs of kidney problems (such as painful urination, pink/bloody urine, change in the amount of urine), muscle spasms/weakness. This medication decreases bone marrow function, an effect that may lead to a low number of blood cells such as red cells, white cells, and platelets. This effect can cause anemia, decrease your body's ability to fight an infection, or cause easy bruising/bleeding. Tell your doctor right away if you develop any of the following symptoms: unusual tiredness, pale skin, signs of infection (such as sore throat that doesn't go away, fever, chills), easy bruising/bleeding. List Sprycel side effects by likelihood and severity. Before using this medication, tell your doctor or pharmacist your medical history, especially of: bleeding problems, current/recent infection, heart problems (such as irregular heartbeat), liver problems (such as hepatitis B). The risk of QT prolongation may be increased if you have certain medical conditions or are taking other drugs that may cause QT prolongation. Before using dasatinib, tell your doctor or pharmacist of all the drugs you take and if you have any of the following conditions: certain heart problems (heart failure, slow heartbeat, QT prolongation in the EKG), family history of certain heart problems (QT prolongation in the EKG, sudden cardiac death). What should I know regarding pregnancy, nursing and administering Sprycel to children or the elderly? Some products that may interact with this drug are: other drugs that can cause bleeding/bruising (including antiplatelet drugs such as clopidogrel, NSAIDs such as ibuprofen/naproxen, "blood thinners" such as warfarin/dabigatran), drugs that reduce stomach acid (for example, antacids, H2 blockers such as famotidine/ranitidine, proton pump inhibitors such as omeprazole). Other medications can affect the removal of dasatinib from your body, which may affect how dasatinib works. Examples include azole antifungals (such as itraconazole, ketoconazole), dexamethasone, macrolide antibiotics (such as clarithromycin), rifamycins (such as rifampin, rifabutin), St. John's wort, telithromycin, among others. Does Sprycel interact with other medications? Should I avoid certain foods while taking Sprycel? Lab and/or medical tests (such as complete blood count) should be done while you are taking this medication. Keep all medical and lab appointments. Consult your doctor for more details. 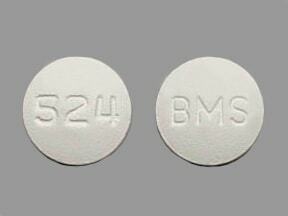 This medicine is a white, round, film-coated, tablet imprinted with "BMS" and "524". 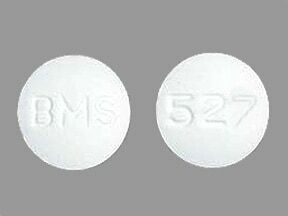 This medicine is a white, round, film-coated, tablet imprinted with "BMS" and "527". 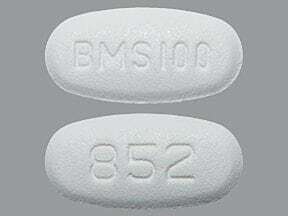 This medicine is a white, oval, film-coated, tablet imprinted with "BMS 100" and "852". 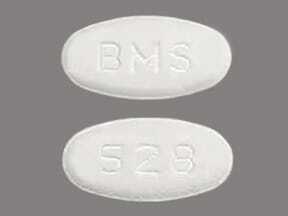 This medicine is a white, oval, film-coated, tablet imprinted with "BMS" and "528". Are you considering switching to Sprycel? How long have you been taking Sprycel?